Well crafted elements and a great story. The watch is rather large. 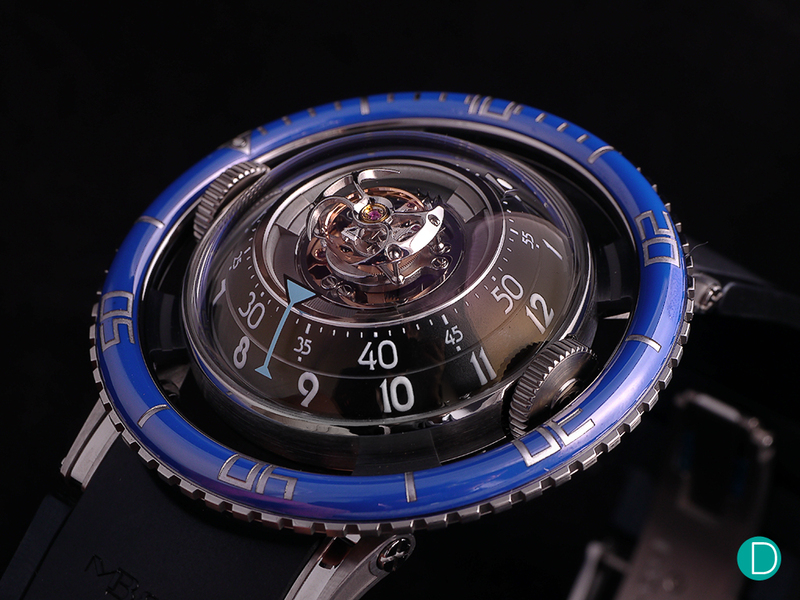 Much have been said about the latest MB&F creatiion: the HM7. We published our impressions based on the Press Release here. At the show we got our full hands-on with both versions of the watch in SIHH 2017. 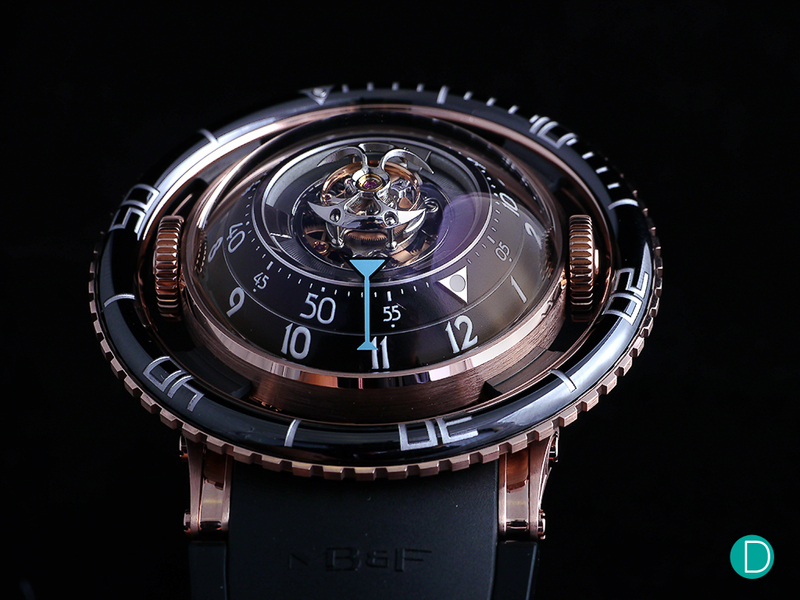 Here is our full review of the MB&F HM7. This will not be one of our typical reviews, as we have already covered the usual headlines in our impressions piece. So the essential reading is our Press Release coverage of the HM7. The MB&F HM7 in a red gold case, and black bezel. During our hands-on session, we were told by MB&F that the inspiration for the pointer for time indication is inspired by a martini glass. Its one of those things…once you see the martini glass, you cannot unsee it. Some of the initial reactions we received from readers is that the watch looked quite like the Vianney Halter Deep Space. The Deep Space is designed with a similar high dome sapphire glass covering the dial, but that is perhaps where the similarity ends. Having seen both watches in the flesh, so to speak, we can confirm that other than the domed crystal, there is little in common between the watches. It may, however also be interesting to compare to another watch which feature a domed crystal on the front, with a similarly domed dial – the Megallan 1521 Collection. The Megallan is targetted at a totally different price point, the movements are basic ETA automatic variants, but the visual impact of the high dome crystal and domed dial evokes perhaps a similar aesthetic. the Megallan only has a high dome crystal on the front, and a flat back, so the similarity only extends to the domes of the case and dial. The red gold case contrasts nicely with the black ceramic bezel which is has titanium inlays for the 5 minute markers. The dome crystals are both on the front and back of the watch, and are hemispheres. A complete half on the front and a second complete half on the back of the case. The crystals are joined by the the case band in the center. The case band is either in red gold, as shown in the leading picture above, or in titanium which we show below. In titanium, the MB&F HM7 lakes on a different look and persona, so to speak, from her red gold cousin. The blue bezel, floating around the periphery of the case is quite stunning. The bezel is not part of the case, but a separate structure. The bezel is in ceramic, either in a stunning blue for the titanium cased version and in black for the red gold variant. Although the is not strictly a diving watch, as the HM7 is rated to only 50m water resistance, the bezel is unidirectional, and turns in assuring clicks through the range. The bezel is also marked clearly in 5 minute intervals with alternate arabic numbers and bars. The markings are first engraved in the ceramic using a laser. The engraved sections are then filled with metalized titanium. And finally the whole ring is polished to a high gloss. Note that the surface is also domed to echo the crystal. Quite a complicated way to achieve the stunning looks, and not dis-similar to the methods developed by Omega for their Planet Ocean‘s ceramic bezels with Liquidmetal® inlay. There are two crowns, the one on the left is for winding the watch, and the one on the right is for setting the time. These sit in between the bezel and case proper. The crowns are massive and provide good leverage for both functions. Time reading is unusual, as the domed dial is split into an outer ring indicating the hours and an inner ring indicating the minutes. Both rotate at their respective speeds. The time is read with a blue marker at the usual 6 o’clock. During our hands-on session, we were told the inspiration behind the design of the marker is the martini glass. It is one of those things, that once you have seen the martini glass as described, there is no way to un-see it again. And sitting high and proud in the middle, is the flying tourbillon. 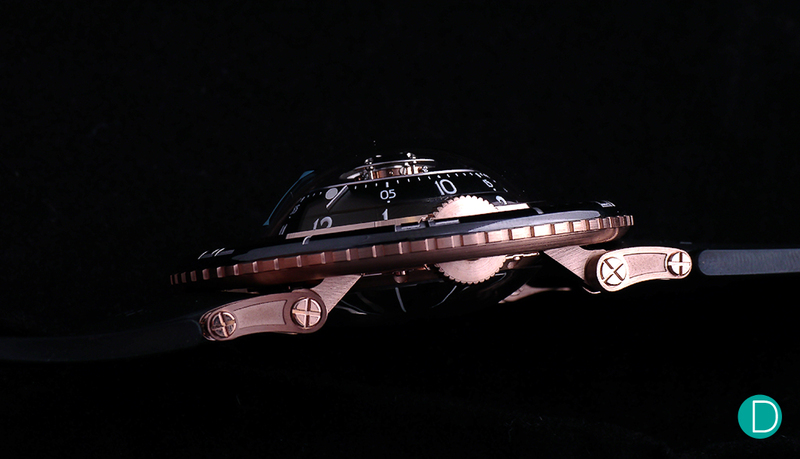 The design is similar to the one used in the MB&F HM6 featuring the signature Battle Ax motif. We will not be surprised if it is the exact same tourbillon. 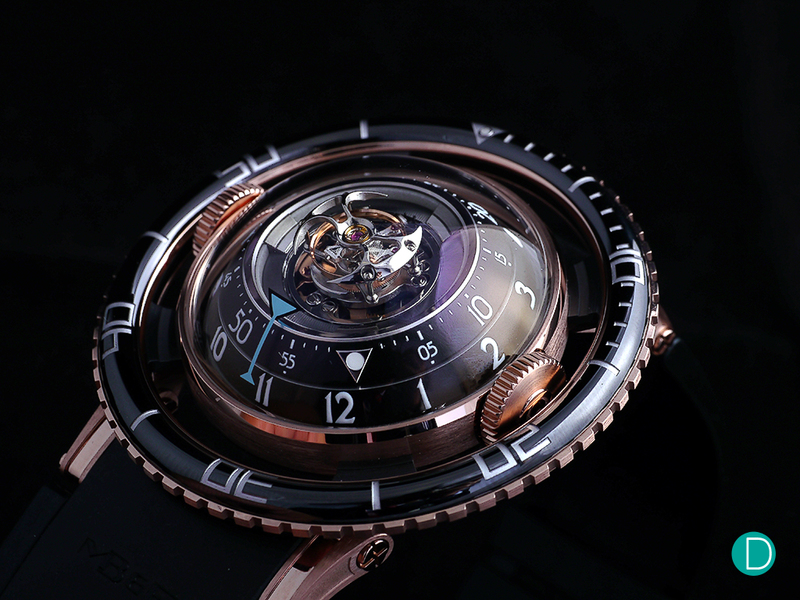 The HM6 adds a set of eyelids which can close on demand, but the HM7’s tourbillon is visible all the time. In addition, three panels of AGT Ultra (Ambient Glow Technology) lume around the inside of the movement illuminate the tourbillon by night. Overall, the visual effect is rather stunning, and quite consistent with the jellyfish inspiration story as told by Max. The design extends to the back, where the rotor is designed to look like the tentacles of the jelly fish. The Max calls them tentacles, but they look more like the beaks of a squid instead…jellyfish are completely soft, and do not have teeth or jaws. These are machined from a solid block of titanium with a platinum sector underneath. Their curved, three-dimensional nature alternates between polished and satin-finished sections. The case back shows the teeth like structures which form the rotor. The rotor is 3 dimensional and curved, and makes for a beautiful aesthetic consistent of the dome back. As described in the release impressions article, the HM7 Engine is built in a vertical manner. As we look at the power flow of the movement train, we go through various levels from the case back to the front of the dial. From the back is the rotor at the case back which passes power to the next level in, which is the barrels, which drive the wheel train which is on the next level, and finally, the third wheel drives the tourbillon carriage which is at the lowest level (from the case back). 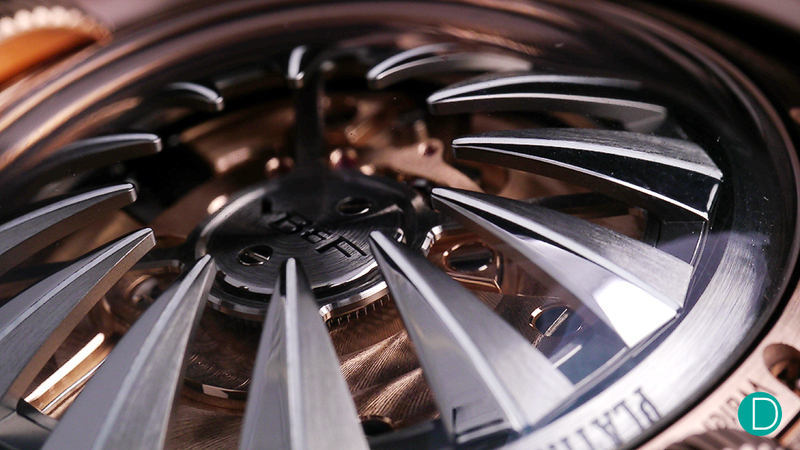 The tourbillon can be seen in the center of the dial, and sits proud for all to view. The movement is arranged vertically, rather than horizontally spread out like almost all other watch movements. In our description above, we traverse from bottom to top. The lugs are articulating, and allow the domed back to sit well on the wrist. The visual design is a triumph. Kudos to the team of Max Büsser and Eric Giroud to successfully take the jelly fish inspiration and transformed it into a beautiful, wearable watch, albeit one which is quite large. The case measures a whopping 53.8mm in diameter, and would suggest that it is too large to be comfortable on the wrist, especially when the watch is a huge 21.3mm thick. But on the wrist, it does sit rather comfortably.It even fits under the cuffs of the author’s shirt. The articulating lugs do their job very well, and allows the entire case structure to hug the wrist. Visually, the impact of the huge case as suggested by the dimensions, is softened by the negative space between the floating bezel and case proper. The watch is a rather massive 53.8 mm in diameter and the entire structure measures some 21.3 mm high. But perhaps the visual of the negative space afforded by the floating bezel and case , makes it look more open and airy. The articulating lugs allow the watch to be worn comfortably, as shown here on a regular sized wrist, and will fit under the cuffs of the bespoke shirt rather easily. As usual with MB&F watches, the HM7 is a supreme artistic interpretation of a timepiece. The inspiration that Max takes his ideas from, and the extent he is able to stretch those concepts is remarkable. 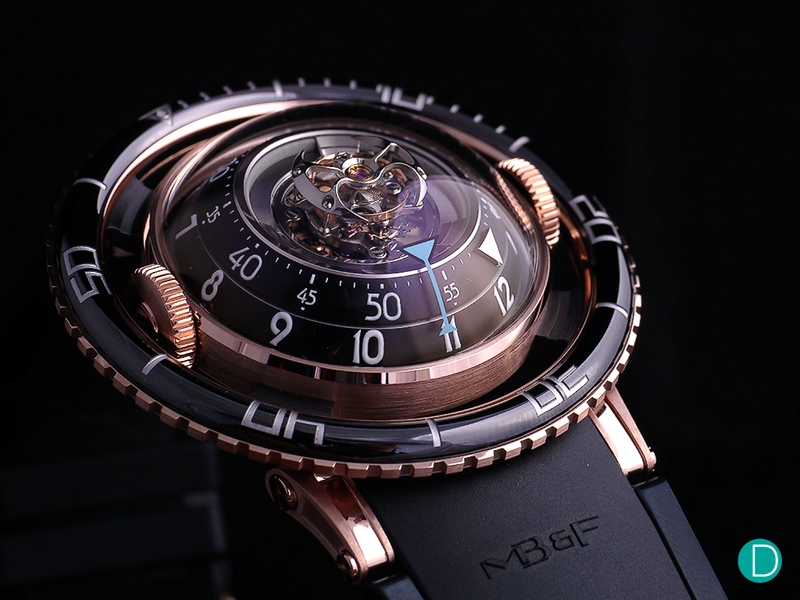 Almost all the MB&F watches are unique in their own way. Almost all are statements with strong artistic and sculptural elements with beautiful aesthetics built over solid watchmaking. And as we see the HM7 is totally consistent with those ideals. In terms of pricing, we think the “Complications for less” philosophy is also applicable. This is the least expensive MB&F tourbillon. 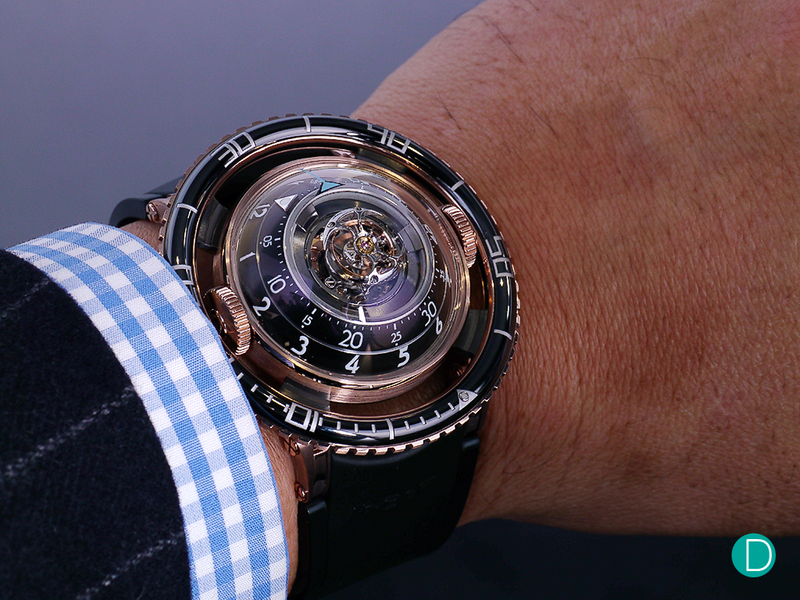 The HM1 featured a tourbillon, and debuted at US$ 150,000 in 2005. And the other MB&F watch to feature a tourbillon, the HM6 retails for a whopping US$ 230,000 in titanium at launch in 2014, and a second 50 pieces in a sapphire case, the HM6 SV was released in 2016 for US$ 368,00 in 18k red gold, and the MB&F HM6 SV in platinum at US$ 398,000. And considering that the HM7 features a new movement architecture with a tourbillon, the asking price of S$160,500 with GST for the titanium cased version and S$193,500 with GST for the red gold variant seems rather reasonable. Full specifications, please refer to our Impressions based on the MB&F HM7 Aquapod Press Release here. And the official MB&F HM7 page is here.